Two-time defending European champions Spain can qualify for the knockout stage with a win on Friday night when they face Turkey. 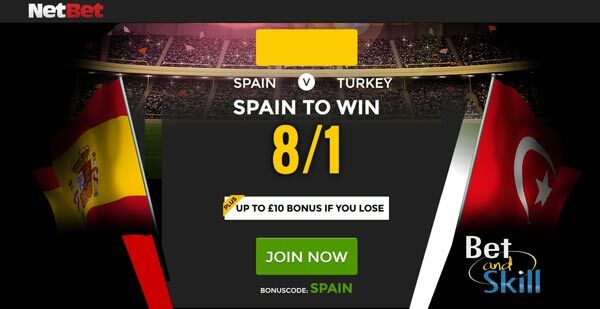 Don't miss our Spain v Turkey betting preview with expert predictions, free tips, enhanced odds, probable lineups, exclusive bonsues and no deposit free bets offered by best online bookmakers. Spain opened their Euro 2016 campaign with a narrow 1-0 win over Czech Republic. La Roja controlled the game but they lacked quality finishing, and needed a Gerard Pique's header to get all three points. They are now 10W 2D 1L in their past 13 matches in all competitions and a perfect 9W 0D 0L in their past nine competitive games, including eight wins in a row during Euro 2016 qualifying. Vicente Del Bosque has no fresh injury concerns ahead of the meeting but he is expected to refresh the attack. Pedro come into the starting XI on the left flank, replacing Nolito who disappointed last time out. Juventus striker Alvaro Morata could get another chance as the lead striker. Athletic Bilbao striker Aritz Aduriz is another option. Turkey need to get at least a point here after losing 1-0 their opening encounter to Croatia, as Luka Modric scored a sublime long-range volley on 41 minutes to seal the victory for Ante Cacic’s side. A 1-0 win might look as though it was a close game, but Croatia should have won by a more comfortable scoreline. The Turks have not defeated Spain in 52 years. Fatih Terim's men have lost their previous two competitive meetings with Spain and face an uphill struggle to secure victory. Gokhan Gonul and Mehmet Topal are major doubts, and Terim could decide to replace them with Semih Kaya and Sener Ozbayrakli in defence. Burak Yilmaz and youngster Emre Mor may both feature from the off here. Arda Turan, Hakan Calhanoglu and Oguzhan Ozyakup, the most talented midfielders of the team, will retain their starting berth as well as new Inter Milan signing Caner Erkin in left back position. "Spain v Turkey predictions, betting tips, lineups and free bets (Euro 2016 - Group D - 17.6.2016)"